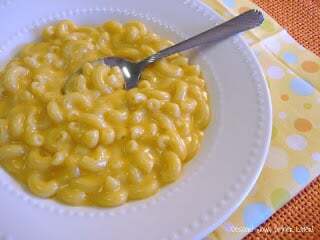 Creamy Crockpot Macaroni & Cheese - Dessert Now, Dinner Later! 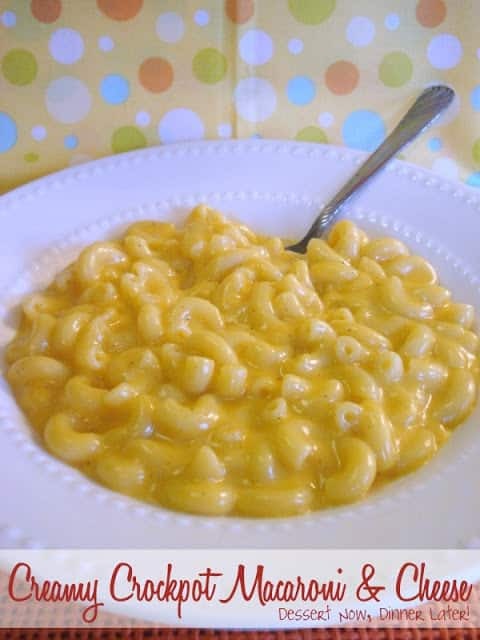 I saw this macaroni & cheese on one of my favorite food blogs (Six Sisters’ Stuff) & knew it had to be fattening because it looked so creamy. Haha! Well, I decided I had to make it anyway because my kids are picky & I figured this would be one meal they would actually eat. Well, I was right! My extremely picky 3 1/2 year old asked for SECONDS! I couldn’t believe it! 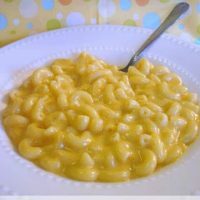 This macaroni & cheese is kind of high maintenance for a slow cooker meal, but it is so CREAMY & delicious. I was totally just going to make a sandwich for myself & eat this on the side, but it was so creamy & cheesy that I totally had a bowl full. Anyway, this is an extremely kid friendly dish, so there you go! Par-cook macaroni noodles by boiling for 6 minutes. Drain & set aside. Meanwhile, in a small saucepan, melt butter with cheese. Stir until completely melted. Spray the inside of a 4-QT slow cooker, add sour cream, condensed cheddar cheese soup, milk, salt, pepper, & mustard. Add melted butter & cheese. Mix well. Stir in cooked macaroni. Cook on low for 2 to 2½ hours, stirring every 45 minutes (equals two times) until the noodles are done & have soaked up a lot of the cheese sauce. Serve as is or as a side dish. 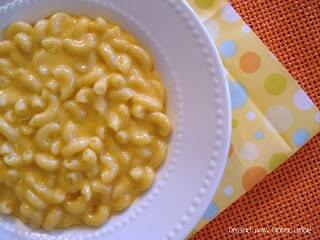 I love a good creamy, cheesy mac and cheese recipe! My oldest son LOVES mac n cheese! It’s his favorite meal! I love trying new recipes for homemade versions. This looks really yummy and I’m sure it would have his approval. I’m visiting from “Mop It Up Mondays” and following your blog via Facebook, Pinterest, and Twitter. Looks like you have a lot of great recipes on here. I’m going to browse through and pin a few. Have a great week! Oh my goodness! That looks amazing. I always like the extra creamy stuff, but this looks so much better. Thanks for sharing, I am a new follower. Hope to see you at True Aim! Mmmm…what a super easy recipe! I love your blog title too! Ok… stop it… your recipes are making me super hungry tonight 🙂 This crock pot Mac & Cheese looks delicious! I could totally go for a bowl right now! 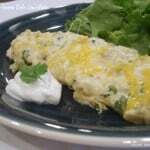 I tried this recipe with adding half a packet of hidden valley ranch and cut up bits of cooked turkey bacon. Also I used low fat cheddar cheese soup and substituted the sour cream for fat free plain Greek yogurt. 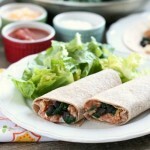 More protein and less fat! It turned out delicious. I’m making this for my father’s Fourth of July party today! Very excited to see how it well turn out. Ive been using this recipe over a year and stopped melting the butter and cheese before adding to the crock pot. Comes out still perfect and less clean up! Can I make this without the cheddar cheese soup? What would I sub in? We have sour cream allergies in the family can this be ommited? Yes, it’s only 1/2 cup so it won’t make much of a difference. Do you have to cook the noodles before. I am going camping amd wanted to make this but was wondering if you could put uncooked noodles in it? You could, but it would take a long time. You could also cook your noodles beforehand, toss them in a little olive oil and place them in a ziplock bag. Then you could just add them to your sauce and just heat them through. Hi! 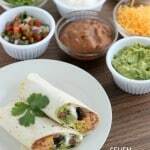 What does the mustard powder add to the recipe? I’m asking because I really don’t like mustard… I’m sure you can even tell its in there, which makes me wonder what it is for. Thanks!! Just a little tang, but you can totally leave it out if you don’t like it! how can this recipe be adapted if you do not own a crockpot? 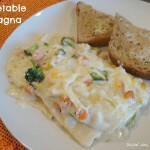 I’d like to try this recipe as it looks scrumptious! I would do everything the same except, when it says to put it in the crockpot for 2 hours, put it in a saucepan on the stovetop instead and cook it over medium heat until it thickens up, stirring frequently. Hi Amber, I came across your post on pintrest. 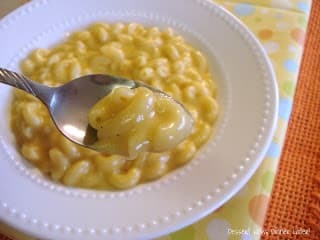 I’m looking for a good crock pot mac n cheese to make as a freezer meal. My 83 yr old grandama had a stroke a few weeks ago and I’m trying to make a bunch of each freezer meals for her to make life a little easier for her now. Do you think this would freeze well? If so do you think I should mix everthing together and then freeze it all? Or should I freeze the sauce seperate and have her add in the noodles when she goes to cook it? I would freeze the noodles and sauce separately. The noodles will soak up the sauce and be mushy if you freeze them together. I hope it works out well. I haven’t tried it as a freezer meal yet, but I don’t see why not. Good luck! Would adding Worcestershire do anything for flavor? I’ve seen a few recipes that used it?. Thank you in advance.